Many youngsters say they begin sniffing when they’re in grade school. They start because they feel these substances can’t hurt them, because of peer pressure, or because of low self-esteem. Once hooked, these victims find it a tough habit to break. Even worse, victims can die suddenly — without any warning. “Sudden Sniffing Death” can occur during or right after sniffing. The heart begins to overwork, beating rapidly but unevenly, which can lead to cardiac arrest. 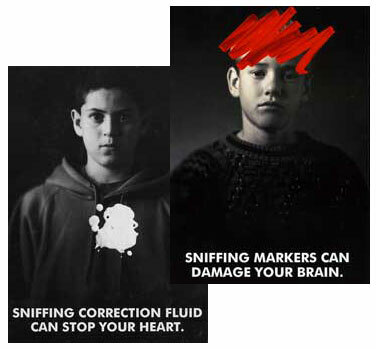 Even first-time abusers have been known to die from sniffing inhalants. Signs of paint or other products where they wouldn’t normally be, such as on the face or fingers. Chronic inhalant abusers may exhibit such symptoms as anxiety, excitability, irritability or restlessness. Showing paint or stain marks on the face, fingers or clothing. Hiding rags, clothes or empty containers of the potentially abused products in closets and other places. There is no typical profile of an inhalant abuser. Victims are represented by both sexes and all socioeconomic groups throughout the U.S. It’s not unusual to see elementary and middle-school age youths involved with inhalant abuse. How does a young person who abuses inhalant die? A 15 year-old boy was found unconscious in a backyard. According to three companions, the four teenagers had taken gas from a family’s grill propane tank. They put the gas in a plastic bag and inhaled the gas to get high. The victim collapsed shortly after inhaling the gas. He died on the way to the hospital. One of the most important steps you can take is to talk with your children or other youngsters about not experimenting even a first time with inhalants. In addition, talk with your children’s teachers, guidance counselors, and coaches. By discussing this problem openly and stressing the devastating consequences of inhalant abuse, you can help prevent a tragedy. Be alert for symptoms of inhalant abuse. If you suspect there’s a problem, you should consider seeking professional help.